This entry was posted in Hunger & Poverty, Quotes, Spirituality & Religious Writings and tagged bread, clothes, dignity, gospel, homelessness, human dignity, hungry quote, judgement, love, money, Mother Teresa, naked, New Testament, rejection, respect on October 30, 2015 by Ray Buchanan. 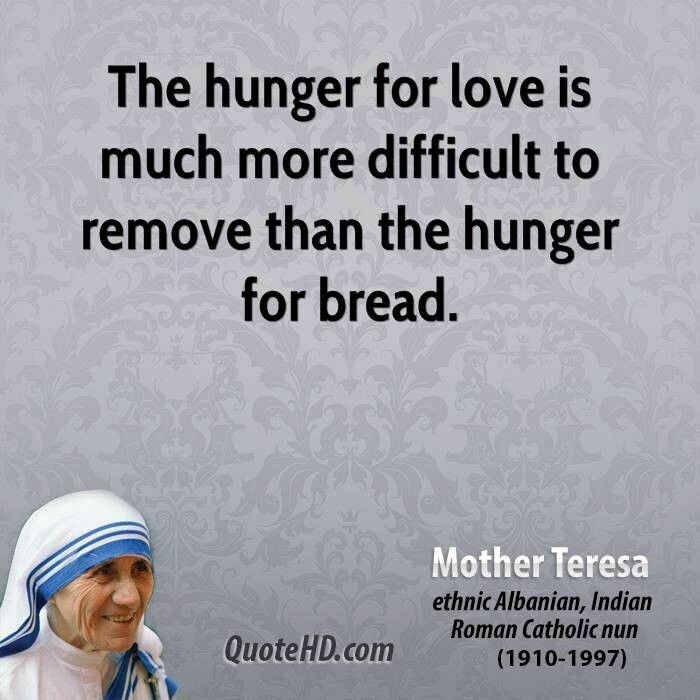 This entry was posted in Hunger & Poverty, Quotes, Spirituality & Religious Writings and tagged bread, hunger, love, Mother Teresa on July 30, 2015 by Ray Buchanan. The author of the Letter of James in the New Testament writes that faith by itself is nothing. Without works faith is dead on arrival. In these lines from The Prophet, the poet tells us that work is love incarnate. But he goes even further. He has the audacity to tell us that we need to have joy in our work. He even goes so far as to write that unless our efforts are motivated by love we have missed the mark so completely it would be better to do nothing. Both writers have hit the mark. Our faith must find expression if it is to remain alive, yet everything we do can and should manifest the love from which that faith springs. Work completed joy is truly love made visible. It is love that can be tasted. And as such it is a powerful demonstration of a faithfulness that goes beyond empty words. This entry was posted in Hunger & Poverty, Quotes and tagged alms, bread, faith, faithfulness, hunger, joy, Khalil Gibran, Letter of James, love, temple, The Prophet, work on March 31, 2015 by Ray Buchanan. This entry was posted in Hunger & Poverty, Prayers, Quotes and tagged bread, hungry, joy, Lord, love, Mother Teresa, peace, poor, poverty, prayer, service, understanding, world on March 29, 2015 by Ray Buchanan. Someone once told me that perception is reality. It took a little time for me to fully understand that piece of wisdom, but once I did, it has had a big influence on my relational skills. Rumi, the well-known and much beloved Sufi poet, describes this by painting us a compelling picture. Bread is bread, right? Maybe, but maybe not. For most of us bread is just another commodity, another item to pick up at the store or check off a long grocery list. But to others bread is life or death, something to fantasize over, something that occupies every waking moment. Those of us blessed with enough food are blessed to have numerous problems. Those that are hungry this morning have only one…bread. Rumi is right. A loaf of bread is a loaf of bread, but it smells far better to some. This entry was posted in Hunger & Poverty, Quotes, Spirituality & Religious Writings and tagged bread, commodities, fantasy, groceries, hunger, perception, poetry, reality, Rumi on March 23, 2015 by Ray Buchanan.